Sleep can be our best friend and our worst enemy. We want it. We know we need more of it. But we just can’t seem to find it when we need to. The National Sleep Foundation recommends 7-9 hours of solid, uninterrupted sleep a night for adults. But busy schedules, stressful jobs, and a never-ending to-do list make it nearly impossible to get that many hours. Unfortunately, the results of a sleepless society are telling. Sleep deprivation is a leading factor in the depression epidemic, lowered immune system function, chronic illness like heart disease and diabetes, high blood pressure, and a number of hormone imbalances. In fact, there is no aspect of our physical, mental, or emotional health that is not affected by our sleep habits. So what can you do if you just can’t fall or stay asleep? The first plan of attack is to try is to adjust your habits. Waking up at the same time each day trains your body to expect sleep. Avoiding bright lights, especially lighted devices like the television or your phone, in the hours before bed makes a huge difference. Sleeping in the same place every night in a calming atmosphere certainly makes a difference. But sometimes those changes are hard to make consistent. Should the next step be over-the-counter sleep aids? Not if you don’t want a whole host of other problems. Sleeping pills often leave you feeling unrested and drowsy the following day. That seems to defeat the purpose! They are also habit-forming, meaning you become dependent on them to sleep and can’t ever go without them, and they have a range of really troubling side effects. Another concern with using sleeping pills is where to store them if you have children who might be able to reach them. The truth is sleeping pills are not a great option for chronic sleep problems. The short-term relief often turns into a bigger sleep problem in the long-term. Luckily, there are a variety of natural remedies for sleep problems that are effective and affordable. Probably the most well-known natural sleep aid, melatonin is a hormone that your body naturally produces to go to sleep. Your body produces melatonin based on light, which is why the light from your phone may keep you from getting sleepy enough to actually fall asleep. You can take a synthetic melatonin tablet to help you feel drowsy for bedtime. Chamomile is a wonderful little flower with numerous relaxing health benefits, not least among them the ability to put you to sleep. Chamomile is calming and easy for young children to drink. It also soothes the digestive system, which may be a cause of your sleepless nights. Another great flower for sleeplessness, passion flower reduces the anxiety associated with that ‘racing mind’ at bedtime. Various studies have been done on passion flower’s sleep-inducing anti-anxiety powers that have found it to be equally as effective as common anxiety medications, but without the side effects. Most people have experienced the soothing power of lavender at some point or another. Similarly to passion flower, lavender’s effects on anxiety and depression— a common factor in insomnia— have been extensively studied, with very impressive results. Hops is the special ingredient in beer, but the aroma has been used historically to improve sleep. Abraham Lincoln is rumored to have slept with a pillow full of hops. Valerian root is a natural sedative that calms nerve cells in the brain. It actually blocks the receptors for anxiety, allowing you to turn off the brain long enough to get some shut-eye. Herbs aren’t the only things that can help you sleep, certain minerals are necessary as well. Calcium is used by the body to usher you into the REM stage of sleep. Deficiencies can make your sleep more restless because your body can’t make your body reach that deep sleep. Calcium is also necessary for your body to produce its own melatonin, meaning if you’re deficient, your body can’t make its own sleep drug. Magnesium is another mineral that is essential to sleep. Magnesium is used by your body to relax muscles, as well as for healthy sleep. Magnesium is absorbed particularly well when combined with calcium, which is convenient because a deficiency in either will harm your sleep. No one has trouble sleeping after that big Turkey Dinner. That’s because turkey is actually really high in tryptophan, a natural chemical that your body converts (with calcium) to make melatonin. It may not be practical to load up on turkey every night before bed, but a little extra tryptophan definitely wouldn’t hurt. This product works. 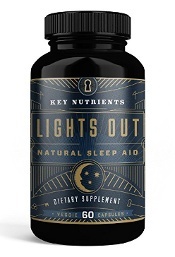 Lights Out has many of the trusted ingredients that help with sleep: Valerian root, chamomile, passion flower, GABA (the key ingredient in valerian root), hops, 5-HTP (a form of tryptophan) and melatonin. It also contains your fully daily requirement of Vitamin B-6, which is necessary for your body to absorb the various amino acids and nutrients needed to sleep. Lights Out also adds Lemon Balm, another great product for relaxation. This supplement will help you fall asleep and stay asleep. 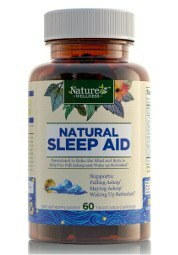 Another great option for a sleep supplement is Nature’s Wellness Natural Sleep Aid. This aid has almost all of the ingredients we mentioned! The formulation includes magnesium, l-theanine (an amino acid found in green tea and other leaves that reduces anxiety and lowers the heart rate), lemon balm, passion flower, hops, chamomile, GABA, 5-HTP (form of tryptophan), melatonin, L-Tryptophan, and valerian root. It is a potent concentration of everything you need to fall asleep. Not so good with pills? 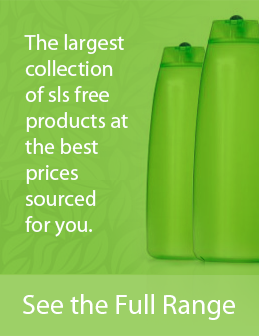 If you don’t like taking pills, then there are various sprays that you can try as well. Tranquility Labs Sleep Spray is sprayed in the mouth, either on or under the tongue, and then absorbed and swallowed. This formula boasts a generous dose of Vitamin B6, melatonin, valerian root, chamomile, 5-HTP, and lemon balm leaf. Although not quite as potent as the pills, it is a great option for occasional sleeplessness or restlessness associated with traveling. You don’t have to spend a lifetime struggling with chronic sleep problems that lead to chronic illnesses! Use one of these safe, side effect free supplements to get the quality sleep that you need. Your body will thank you, and so will your mind.